The EX6100 has a slightly different feature set than the EX6200, with the key differences summarized in Table 2. The EX6100's web admin interface is pretty much the same as the EX6200's, as is its setup wizard. Setup can be done completely over a wireless connection so can be done with a tablet or even smartphone. You just connect to either default SSID (EX6100_NETGEAR_2GEXT or EX6100_NETGEAR_5GEXT) and launch your browser. If you're not automatically redirected to the setup wizard, entering http://mywifiext.net in your browser address bar should get you there. The EX6200 review and its gallery's annotated screenshots should give you a good idea of driving the EX6100. There are a few feature differences of note, however. Starting on a disappointing note, although the EX6100's status display (screenshot below) shows the link rate between it and the router it is connected to, the EX6200's signal strength readings are not to be found. I hope this is just temporary and fixed in a firmware update. Boo! No signal strength indicator! I was surprised to find the option to enable a NAT firewall, something not offered on the EX6200. Since the EX6100 can be used as an access point, you get a few more wireless controls than on the EX6200. Not shown are the MAC address filters. The gallery has a few more admin and setup screenshots and more internal hardware photos as promised earlier. Inside view with front cover removed. Everything is tidy and cables are guided and secured. You can see all three antennas in this shot. Closeup of the empty case showing the AC plug prong contact. These press against pads on the board. Two board assembly removed from case. The black plate is a heat spreader. Thermal pads contact the back of the signal board at multiple points. The assembly flipped over. The power supply board is wrapped in a paper shield. Note the AC contacts at the top of the photo. Front of the signal and power boards disconnected and laid side by side. Sorry you can't see most of the component markings. Damned laser marking! The setup wizard starts by confirming that this switch is set properly. You can enable a NAT firewall, something most users won't use. The end of the setup wizard directs you to check the Extender placement LEDs, which are pretty neat. Note the Ethernet ports to WiFi use the following band setting. There is no explanation of this in documentation. The same new test procedure used to test the EX6200 was used on the EX6100, which was upgraded to latest v1.0.0.28_1.0.66 firmware before testing. 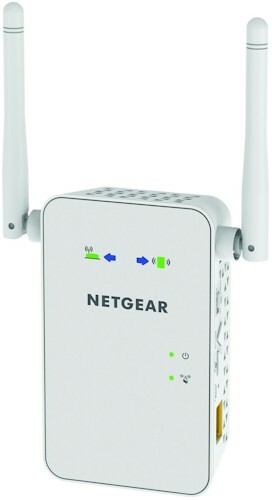 Since this is an AC class repeater, the same NETGEAR A6200 AC1200 class USB adapter used to test the EX6200 was connected to the test client laptop and its internal Intel Centrino 6300 adapter disabled. Before testing, I changed the 2.4 GHz radio from its default "Up to 300 Mbps" Wireless Mode setting, i.e. 40 MHz bandwidth mode, to "Up to 145 Mbps" mode, in keeping with our 20 MHz bandwidth test standard for 2.4 GHz. The EX6100 should have automatically used the same setting as the router it was extending, but I didn't want to take any chances. The wireless results in the Benchmark Summary represent "extended" wireless throughput, i.e. from base router, through the EX6100 and to the test client laptop. The wired results are what we measured with the test laptop's wireless disabled and connected to the EX6100 Ethernet port. Following the 50% wireless extender/repeater throughput reduction rule of thumb, we would expect the "wireless" results to be around half the "wired" throughput. But instead, there is essentially no throughput reduction for 2.4 GHz. 5 GHz downlink did behave as expected with 32 Mbps wireless throughput received at the test client out of 57 Mbps available at the extender. 5 GHz uplink is harder to accurately judge, because throughput was so low. But from the throughput measured, 9 Mbps was extended to the test client out of 12 Mbps at the extender. During each test, I noted link rates, which are summarized in Table 3. What these tell us is that signal strength from client to the EX6100 was stronger than from the EX6100 to the testbed router. For comparison, the EX6200's link rates to the same reference router were 78 Mbps and 234 Mbps for 2.4 and 5 GHz, respectively. For a look at how steady throughput is, we'll turn to the IxChariot plots. Each is a composite of the test plots for the wired test (extender_eth) and wireless (extended). ...as does 2.4 GHz uplink.